Note: This post is primarily for photo gearheads. It should answer most questions about the technical details of the visual problem. Most studio and location portrait shoots are similar. If there are any additional questions or comments, please feel free to add them to the comment section below. Let's get back to work on our visual problem. The problem is to visually represent three regional wineries for a magazine. We've decided to shoot the subject in a studio style. We've turned in our list of supplies. Now let's fill in some gaps. As stated, the newsroom floor of the building was destroyed by the hurricane. Although the studio survived, all the equipment from the office is stored inside the space making it useless for work. All the conference and meeting rooms have been temporarily converted into newsroom space. The entire photo department now occupies a former storage room. All foyers except the front foyer have been converted into temporary newsroom space as well. However, the secretaries for news and circulation leave the building around 6 p.m. We can use the reception lobby of the circulation department once they leave. We'll need to improvise backgrounds and working space, but if tables, desks and chairs are moved out of the main pathways, it'll work. This is the location and design for the cover shot for Metropolitan Beaumont magazine in The Beaumont Enterprise circulation reception area in Beaumont on Thursday, Feb. 2, 2006. Note the receptionist's desk, paperwork and copier. Background is part of the overall concept. The options would be to use a seamless paper background taped to the wall, a table cloth or other patterned material. I opted to use the actual wine bottles as the main background and tape up a black sheet to cover the wall. To accomplish this, I need to backlight the bottles to make them pop off the background. Consequently, I'll need enough room between the posing table and the background to set a light at a low angle. This throws the background completely out of focus even at f/22. I skipped my concept last time to let everyone consider the supply list. In order to accomplish this series of images, we must have a working concept rather than a random assembly of objects. This allows us to pre-visualize the final images and construct them from the images in our minds. The concept is to use one aspect of the three wineries to set each apart. 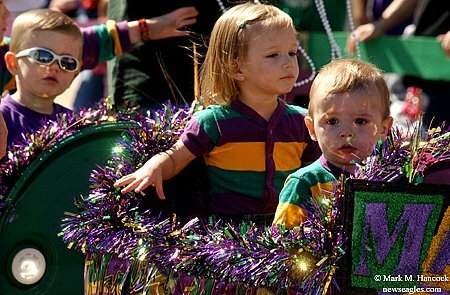 One winery claims to be the closest to the Gulf Coast. Another winery is in the Piney Woods. The final winery only makes fruit wines. We used these aspects to distinguish the different wineries from each another. For the cover, we'll introduce all three factors into the image. The kicker image will have the wines in a tabletop display shot strait forward and lighted from behind. The inside shots feature a single bottle from each winery. Each has a strong diagonal design with a wine bottle, the winery's feature and a contrasting element of the wine. The magazine editor acquired almost all requested supplies and had them in the lobby. She couldn't find a live Caribbean hermit crab (fresh water, bright red), nor fresh champagne grapes. 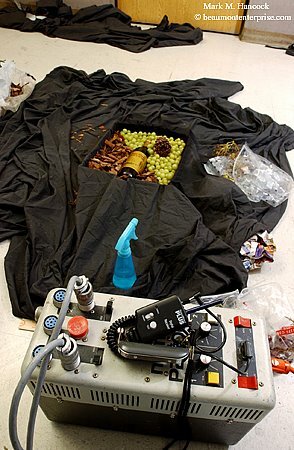 However, she did find realistic plastic and silk champagne grapes. 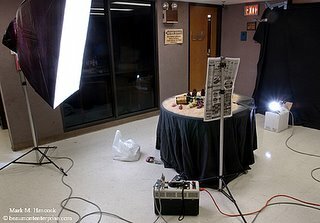 A lobby table was used as the posing table. To get the right elevation for the wine bottles, different height stacks of newspapers were placed under a black sheet. The bottles were positioned on the sheet to fit within the frame. 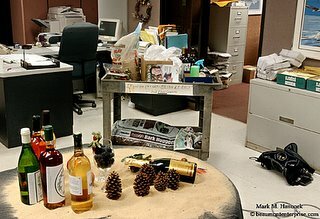 Several layers of newspaper were taped into a circle to prop up the champagne bottle without showing. Then, sand was poured over the table to hide the sheet. The faux grapes cover the prop roll. This configuration makes the kicker image. This is a reverse look at the location. It shows the lighting scheme and design for the cover shot for Metropolitan Beaumont magazine in The Beaumont Enterprise circulation reception area. A large softbox was the primary light source. A newspaper taped onto a light stand made an adequate bounce card (the studio bounce cards are trapped somewhere). A snooted strobe head sat on a taped wine box behind the table to back light the bottles (I forgot my mini light stand). I used The Beast as my only light source. It's remotely triggered with a set of Pocket Wizards to make wireless movement easier. The shutter speed is at 1/500 to completely eliminate any chance of fluorescent light spill over. The example images in this post are shot with available fluorescent light. For the cover, fruit, wine glasses, shells and pine cones were added. The background bottles were reduced to five to make the frame vertical. Once these two images were complete, the three interior shots were made in a box on the floor. The stir sticks kept the pattern accurate for all three images. 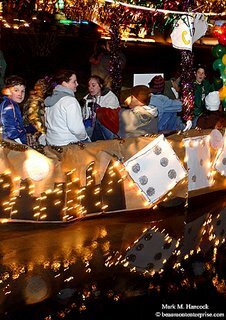 At this point, the lights were both on regular light stands, pointed at the ceiling and each diffused with a regular sheet of copy paper. The Beaumont Enterprise circulation reception area is the location. This is the product design for one of the three inside shots for Metropolitan Beaumont magazine. See the final results here. Before you see the images, try to imagine how the final images will look. See if the results are the same as the image in your mind. 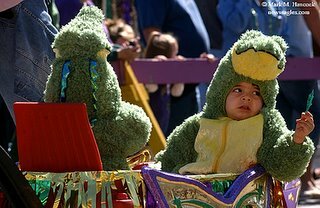 James Gary Sanderson, 3, (right) and his brother ride in a gator wagon during the Mardi Gras Munchkin Parade in Port Arthur on Sunday, Feb. 26, 2006..
Children ride in an oil barrel train during the Mardi Gras Munchkin Parade in Port Arthur. Dezarae Thibodeaux, 20 months, takes in the view during the Mardi Gras Munchkin Parade in Port Arthur. Aubrey Moore, 3, rides a flower wagon during the Mardi Gras Munchkin Parade in Port Arthur. Jacey Hanley, 5, drives her own Jeep for Krewe Diva during the Mardi Gras Munchkin Parade in Port Arthur. 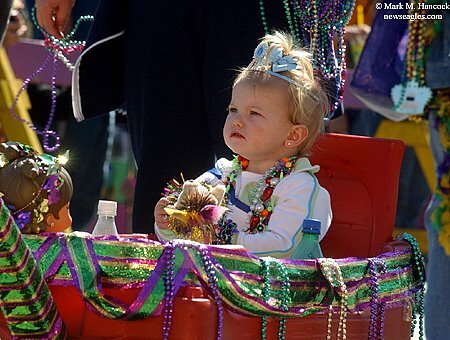 Jalee Neff, 5, smiles after she throws beads during the Mardi Gras Munchkin Parade in Port Arthur. Kim Hall of Orange enjoys a Mardi Gras parade in Port Arthur. 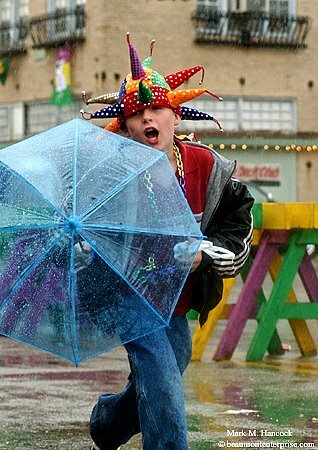 Colton Youngblood, 10, of Cold Springs sings and runs through the Mardi Gras fair grounds on Saturday, Feb. 25, 2006. Krewe captain Jennifer Cowart organizes the krewe before the Mardi Gras Krewe of Aurora Grand Parade in Port Arthur. Shelven Lewis of Port Arthur helps prepare a float before the Krewe of Aurora Grand Parade in Port Arthur. 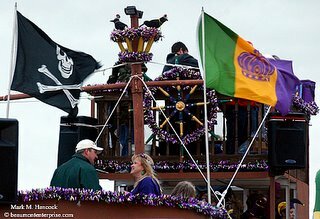 The Krewe of Aurora prepares one of their floats as a barge passes on the intercoastal waterway before the Krewe of Aurora Grand Parade in Port Arthur. 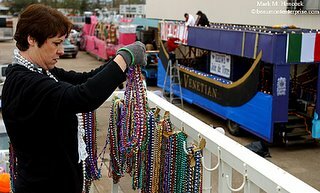 (Right) Torey Chevis helps prepare the Cumulus Radio float before the Krewe of Aurora Grand Parade in Port Arthur. (Below) Krewes begin to work their way to the parade route during the Krewe of Aurora Grand Parade in Port Arthur. Mardi Gras fans scream for beads and toys during the Krewe of Aurora Grand Parade in Port Arthur. KBTV Ch. 4 on-air news personalities Nick Canizales, (from left to right) Maura Siefring and Dana Melancon laugh at each other's dancing atop their float before the Mardi Gras Krewe of Aurora Grand Parade in Port Arthur. 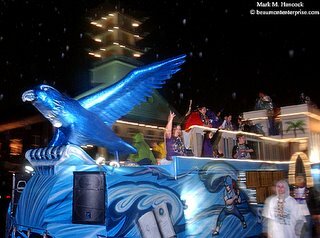 Beads fly from the Motiva float during the Mardi Gras Krewe of Aurora Grand Parade in Port Arthur. Glen Lyles of Bridge City finishes off a gelatin shot before the Mardi Gras Krewe of Krewes Parade in Port Arthur on Friday, Feb. 24, 2006. 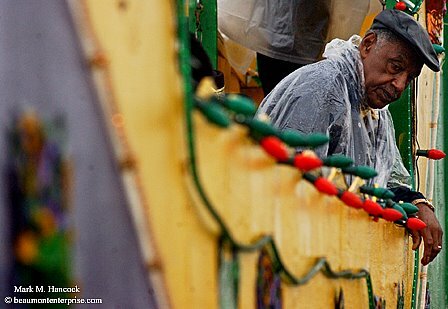 Krewe members prepare a float before the Mardi Gras Krewe of Krewes Parade in Port Arthur. Howard Provost of Port Arthur (left) and Rachel Lawson of Groves (right) talk on their float before the Mardi Gras Krewe of Krewes Parade in Port Arthur. 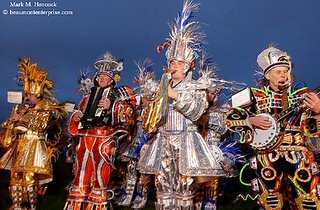 The Woodland String Band, AKA The Mummers band, from Philadelphia warms up before the Mardi Gras Krewe of Krewes Parade in Port Arthur. Lamar State College - Port Arthur krewe members throw beads in the rain during the Mardi Gras Krewe of Krewes Parade in Port Arthur. 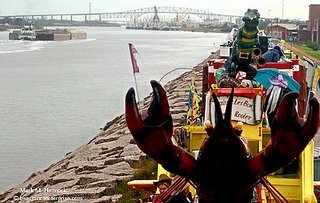 The traditional Courir Parade features a masked horse rider collecting gumbo ingredients from houses and businesses along a parade route. Along the way, chickens are released for the children to chase and capture for prizes. 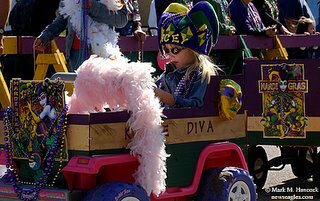 Consequently, the first parade in Port Arthur's Mardi Gras is known as "the chicken parade." 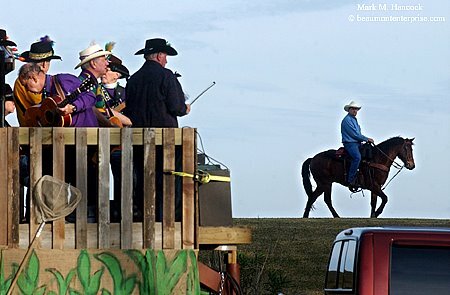 Larry Shackelford (right) of Nederland rides Coco, a 10-year-old horse, along the intercoastal canal as the Cajun Country Classics band (left) prepares to perform before the Mardi Gras opening parade in Port Arthur on Thursday, Feb. 23, 2006. 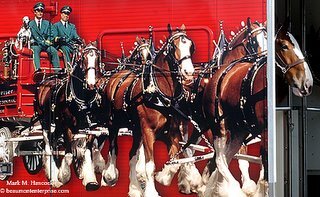 A Clydesdale on the Budweiser team waits to be hitched to a wagon before the Mardi Gras opening Courir Parade in Port Arthur. 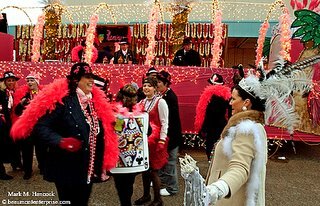 Members of the Mid-County Krewe de Acadiana coordinate by a float before the Mardi Gras opening Courir Parade in Port Arthur. 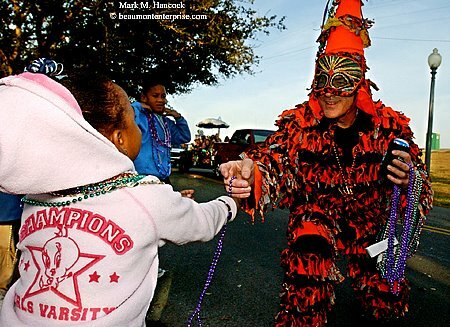 In a traditional parade, a masked rider (played by krewe captain John Duplant, left) goes to houses and businesses to collect ingredients for a gumbo. 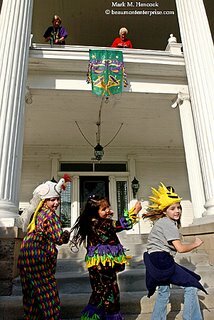 Savanna Sanford, 7, Cheyenne Allen, 6, and Jenna Medina, 7, scramble for beads at Rose Hill Manor before the Mardi Gras opening parade in Port Arthur. Amonnie Lofton, 3, of Port Arthur gets beads from David Prioux of Groves (right) during the Mardi Gras opening Courir Parade in Port Arthur. 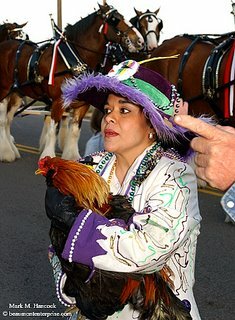 Carmen Blanton, wife of Port Arthur's chief of police, prepares to release a rooster at a stop during the Mardi Gras opening Courir Parade in Port Arthur. Along the way, chickens are released for the children to chase and capture for prizes. The first two roosters are still at large. This rooster and a duck were caught. Lynda Wood of Port Neches holds Skippy, 2, (left) and Jojo, 4, (right) as they watch horses during the Mardi Gras opening Courir Parade in Port Arthur. 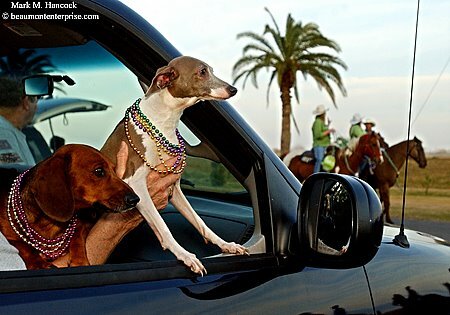 It's time for Mardi Gras with a Texas twist. The 2006 event is particularly important because it's a break from the year of hurricanes. 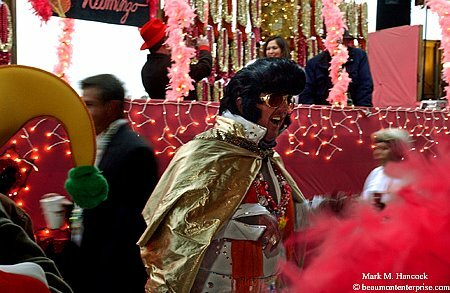 Southeast Texans can celebrate their survival and reconstruction. The following links show my images of the 2006 Southeast Texas Mardi Gras activities. 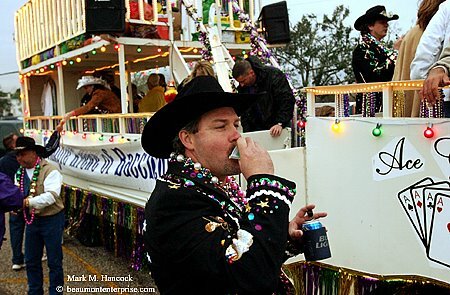 Or choose the Mardi Gras label to see the last 20 entries (including more recent images) about Mardi Gras on this site. 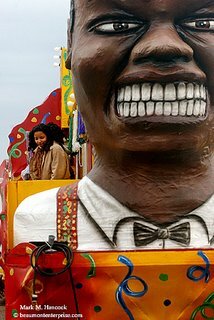 Award Winner: 3rd Place, Photo Package, Hearst Honors for a combination of six images from several days. 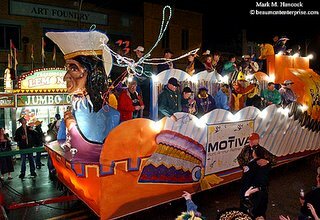 To learn more about Mardi Gras please visit the Southeast Texas Mardi Gras official site. 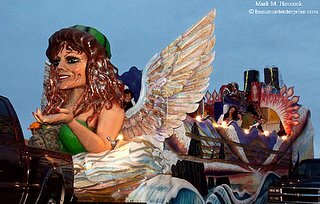 Please also see Fayrouz's shots from Sunday. 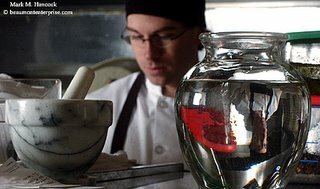 Sous chef Bart Shuford prepares meals at Bryan's 797 in Beaumont on Thursday, Dec. 15, 2005. 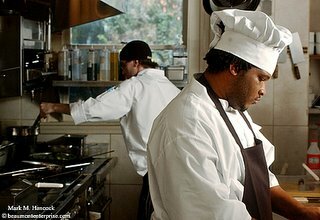 Sous chef Bart Shuford (left) and chef Marcus Evans (right) work in the kitchen of Bryan's 797 in Beaumont. 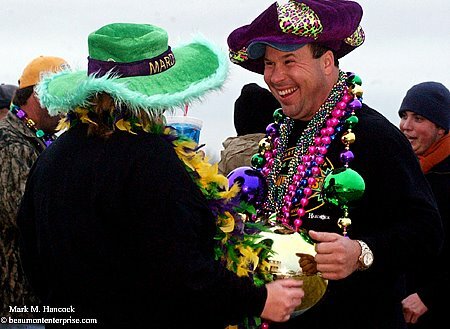 Evans was formerly a chef in New Orleans. He moved to Southeast Texas after Hurricane Katrina. 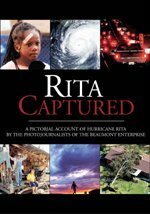 Although he has losses from both hurricanes Katrina and Rita, he said FEMA will only assist him with one claim from either hurricane. Chef Marcus Evans (right) and sous chef Bart Shuford (left) work in the kitchen of Bryan's 797 in Beaumont. 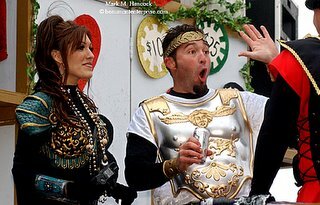 Vidor High School's Jason Williamson (No. 24, right) knocks the ball away from Little Cypress-Mauriceville High School's Kamron Vaughn (No. 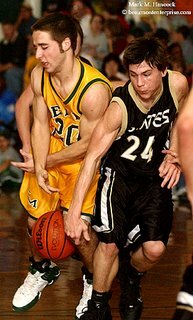 20, left) during a basketball game at LC-M High School on Tuesday, Feb. 14, 2006. LC-M won the game and advanced to the playoffs. We've had some time to consider options for the visual problem. I'm sure everyone has come up with a way to solve it. Let's compare notes. * The wineries are located more than 100 miles apart. * Last month's magazine featured portraits on location. * The story is about products, which can be better displayed in studio shots. At this point, we need to develop a five-image concept. One is the cover, three are inside photos to individually represent the wineries and one inside photo ties the images together as a kicker image. I'll save my concept for now. This way, y'all can look at the following supply list and see if your list would be similar. Since we decided on our approach (studio), we need to turn in our supply list for the shoot. In the next update, we'll look at how the studio space problem was solved as well as the lighting scheme. 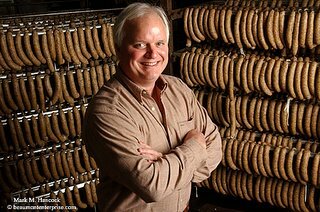 Frank Zummo, president of Zummo Meat Co., Inc., poses for a portrait with boudain sausage at his plant in Beaumont on Wednesday, Feb. 8, 2006. The company ships boudain sausage nationally through a contract with Wal-Mart and its meat products regionally through other contracts. Boudain is a sausage with rice. 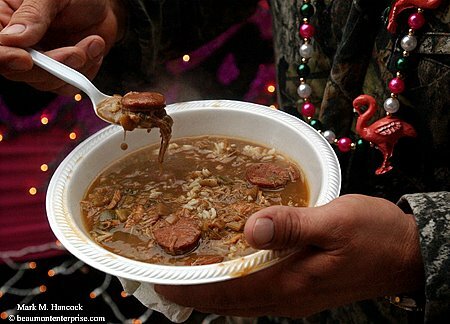 It's typically smoked and a preferred food in this region. 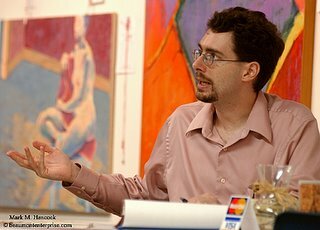 Kevin McCarthy answers questions during registration for The Beaumont Art League's Memorial Auction at the league's facility in Beaumont on Saturday, Jan. 21, 2006. 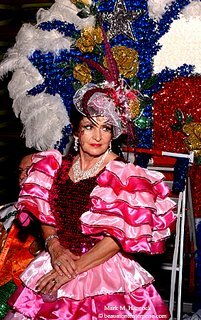 Proceeds from the auction help establish a scholarship fund for Lamar University's department of art in memory of Peggy Wilson. 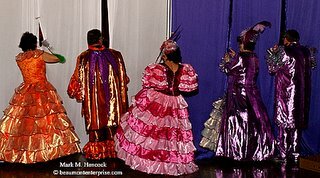 Members of the Aurora Lights dance troupe put on their wings before performing at the Majestic Krewe of Aurora Floral Fantasy Ball at the Beaumont Civic Center in Beaumont on Saturday, Feb. 18, 2006. 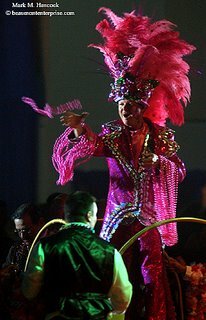 (Right) CC Doyle of the Aurora Lights dance troupe performs during the Aurora Ball at the Beaumont Civic Center. 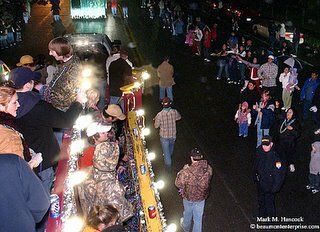 (Below) Royal Escorts help the Aurora Lights move on a cart to throw beads to ball attendees during the Aurora Ball at the Beaumont Civic Center. 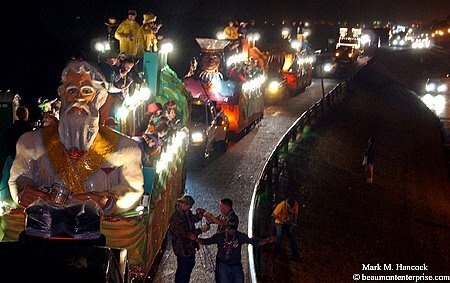 (Above) Royal Escorts move the Aurora Lights on a cart during the Aurora Ball at the Beaumont Civic Center. 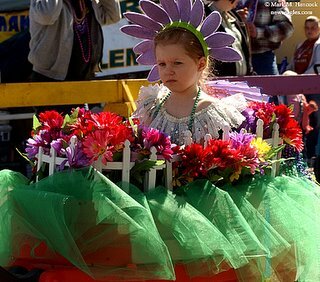 (Right) Laura Childress, krewe captain representing hibiscus, is assisted to a display cart during the Aurora Floral Fantasy Ball at the Beaumont Civic Center. (Right) Glyndon "Big" Childress, representing hibiscus, throws beads from a cart during the Aurora Floral Fantasy Ball at the Beaumont Civic Center. 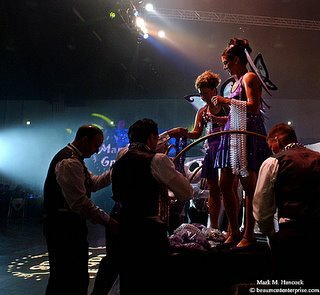 Cynthia Hinds (left), representing lily, has her backpiece adjusted by Guy Thibeault (center) as other members of the royal court watch during the Aurora Floral Fantasy Ball at the Beaumont Civic Center. 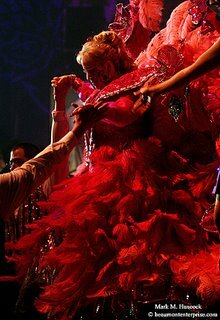 Thibeault's wife Alice, who owns Originals by Alice in Nederland, has designed all the ball costumes for the last 11 years. Wanda Mendoza, representing red rose, prepares to take the stage during the Aurora Floral Fantasy Ball at the Beaumont Civic Center. (Above) Members of the Majestic Krewe of Aurora royal court peek from backstage to see the activities during the Aurora Ball at the Beaumont Civic Center. 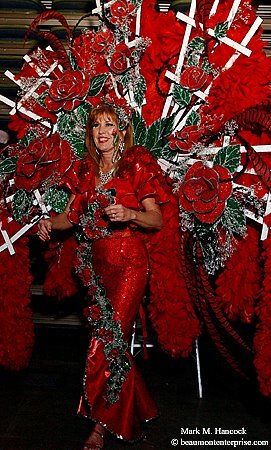 (Left) Dolores Respess, representing pink carnation, waits backstage to be introduced during the Aurora Floral Fantasy Ball at the Beaumont Civic Center. 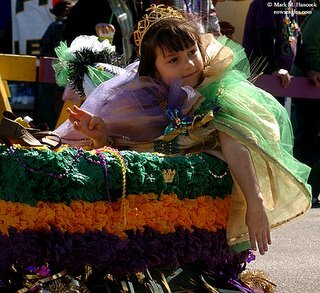 Kacy Manshack, 12, has a laugh with the Krewe of Des Amis de la Rue before the Orange Mardi Gras Parade in Orange on Saturday, Feb. 18, 2006. 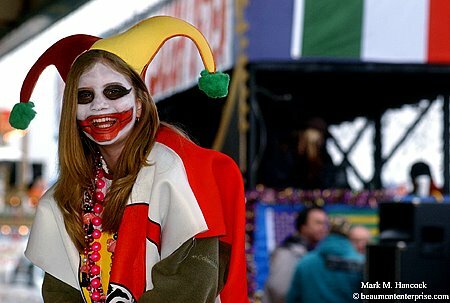 She was dressed as a joker playing card for the Las Vegas-themed parade. (Left) Krispen Choate (left) helps her husband Greg Choate (right) with his costume before the Orange Mardi Gras Parade. (Below) Elaine Cook prepares beads for the Krewe Des Couillons to throw before the Orange Mardi Gras Parade. 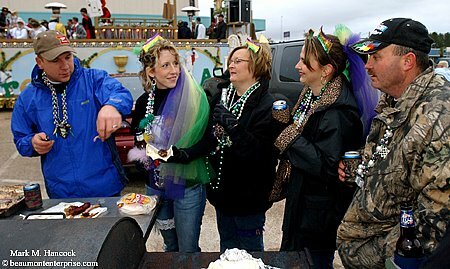 Kenny Elliott, Wendy Elliott, Cindy Foreman, Sherri Foreman and Shannon Foreman of the Krewe Des Couillons gather around a grill before the Orange Mardi Gras Parade. 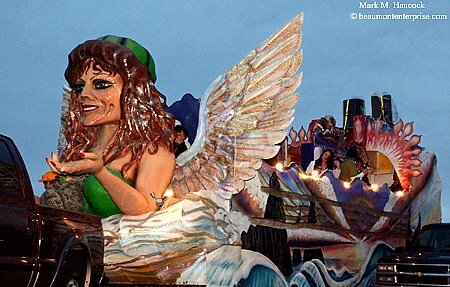 Their krewe's float represented a Las Vegas wedding chapel. John LeBlanc eats gumbo before the Orange Mardi Gras Parade. 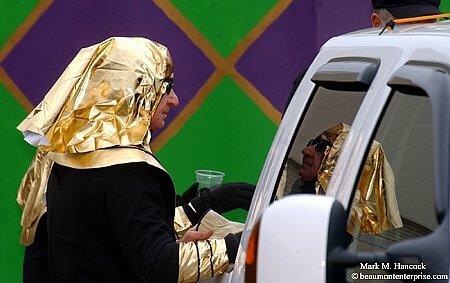 Robert Sims of the Krewe L'Orange reflects on a truck window as he prepares for the Orange Mardi Gras Parade. 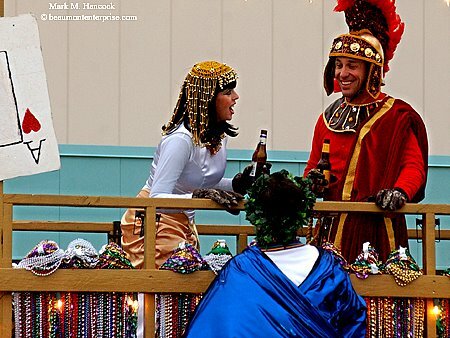 His krewe's float represented The Egyptian. 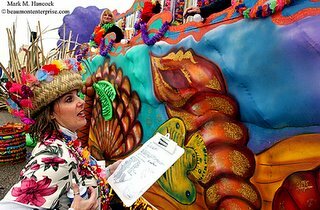 (Right) Cathy Manshack prepares refreshing shots for the Krewe of Des Amis de la Rue before the Orange Mardi Gras Parade. 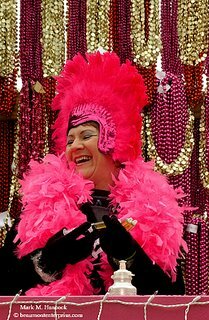 Her krewe's float represented the Flamingo. 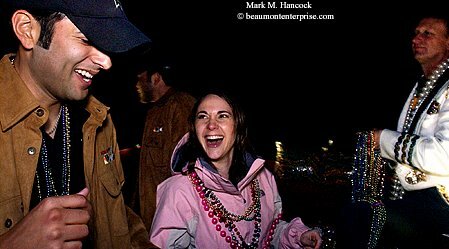 (Below) Tina (left) and Steve Nimitz (center) get good news from Dale Bonin on the Krewe De Bon Amis float before the Orange Mardi Gras Parade. 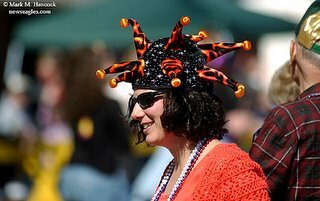 Mallorie Frey reacts during a conversation before the Orange Mardi Gras Parade. Tracey Gilliam (left) challenges her husband Jimmy Gilliam aboard the Krewe De Bon Amis float before the Orange Mardi Gras Parade. Their krewe's float represented Ceasar's Palace. Queen Lady Luck (Sabrina Gray, right) dances with other members of the Krewe of Des Amis de la Rue before the Orange Mardi Gras Parade. (Left) A float appears to float as it goes through a puddle during the Orange Mardi Gras Parade. 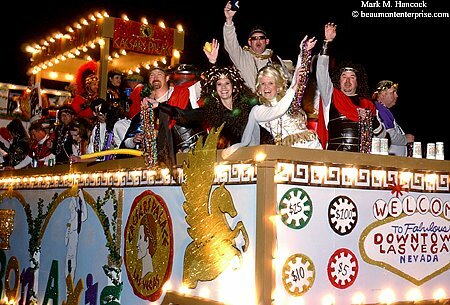 (Below) Members of the Krewe De Bon Amis cheer and offer beads during the Orange Mardi Gras Parade.